Welcome to the second installment in our Cost of Entry series of articles, where we go hands-on with the most affordable, entry-level watches of today’s leading luxury watch brands. In our first article, we looked at Rolex and the Oyster Perpetual, and today, we are checking out what Officine Panerai has to offer with its Panerai Luminor PAM000 Base Logo watch. The remarkable popularity of Panerai is something that needs no introduction to most. Officine Panerai was purchased through the Vendôme Luxury Group by luxury industry giant Richemont SA in 1997; and since the dawn of the new millennium, Panerai has enjoyed a lasting – and for a while, seemingly endless – growth and expansion that was matched by only a handful of other brands. 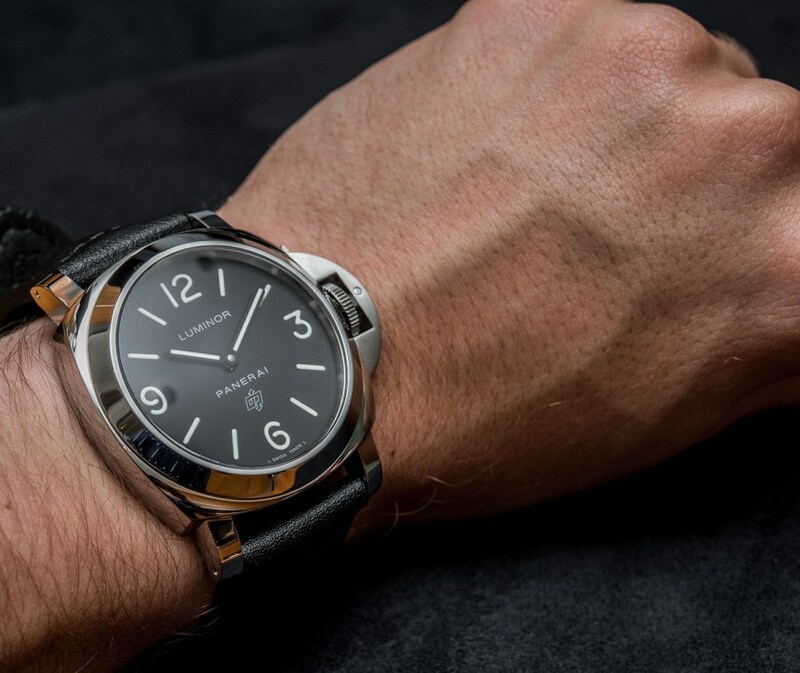 Chances are, if you are reading this, you either already own a Panerai and are thinking about whether also getting the base model is a good idea, or you are interested in the brand and are planning on “entering it” sometime soon. 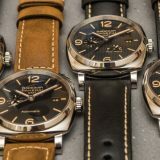 Now, as many of the former could certainly explain to the latter, there is something unique to the wearing experience that a Panerai provides – and we are here to find out whether the most affordable among all Panerai watches can deliver that. 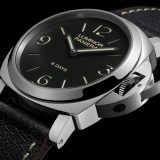 We have covered the history of Panerai in greater detail in our History of Dive watches feature article here, but for the sake of better understanding the Panerai Luminor PAM000 Base Logo watch, we will look into the past of the Luminor line briefly. 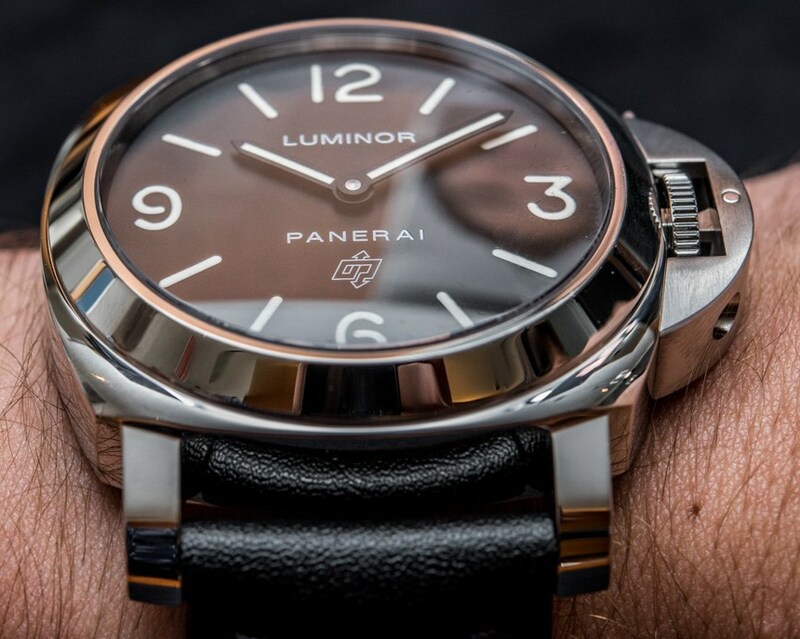 Originally, Panerai used the “Luminor” term only to refer to a luminous substance it debuted in 1949 – the same goes for the brand’s other major collection called Radiomir; but let’s maintain our focus here. Defined by the unique bridge over the crown of the 44mm wide 316L steel case, as well as its integrated lug design, the Luminor collection, for many, is the quintessential Panerai. 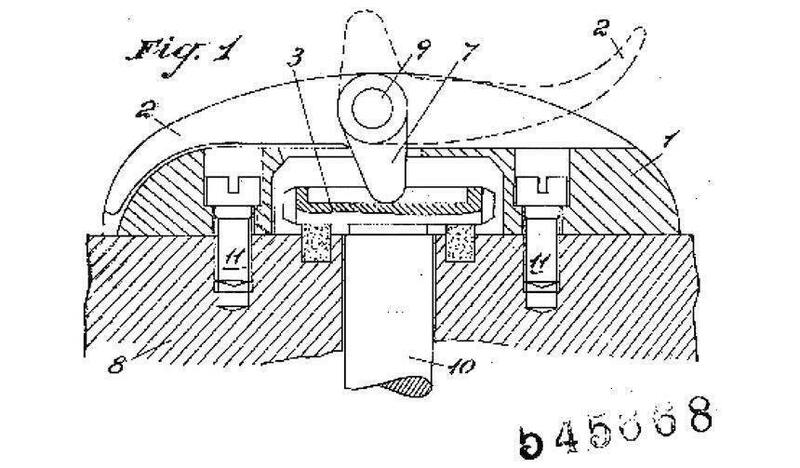 The trademark bridge was debuted by Reference 6152-1 in 1943, but Panerai only patented the design much later, in 1956. 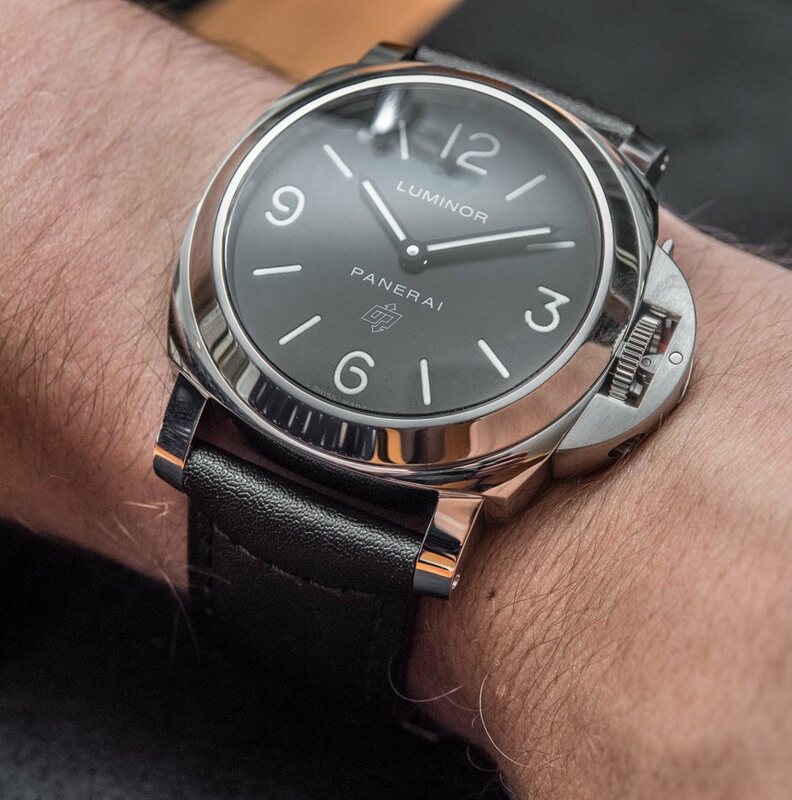 The Panerai Luminor PAM000, of course, proudly features this steel bridge over its crown and it functions as flawlessly as it does on any other Panerai Luminor – you really are not missing out on anything here, unless you’re one for the “REG. T.M.” designation engraved onto the bridges of some other models. 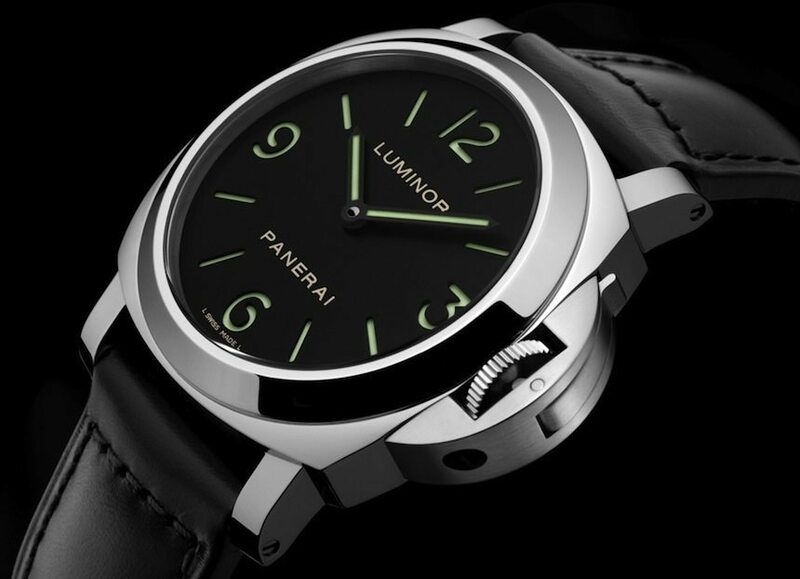 The high legibility is, of course, essential to any true Panerai: the black dial of the Panerai Luminor PAM000 Base Logo comes with excellent lume that appears off-white (with a slight greenish hue) in the day and bright green at night. 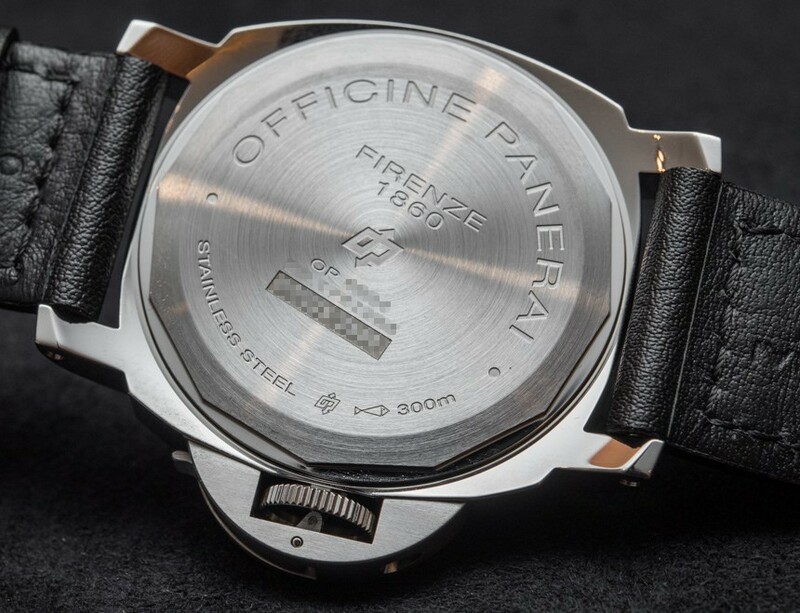 It also displays the OP logo at 6, that comes from Officine Panerai (officine being Italian for “workshops”) and, with its upwards and downwards pointing arrows, is storied to represent the company’s involvement in manufacturing diving and landing aid systems. 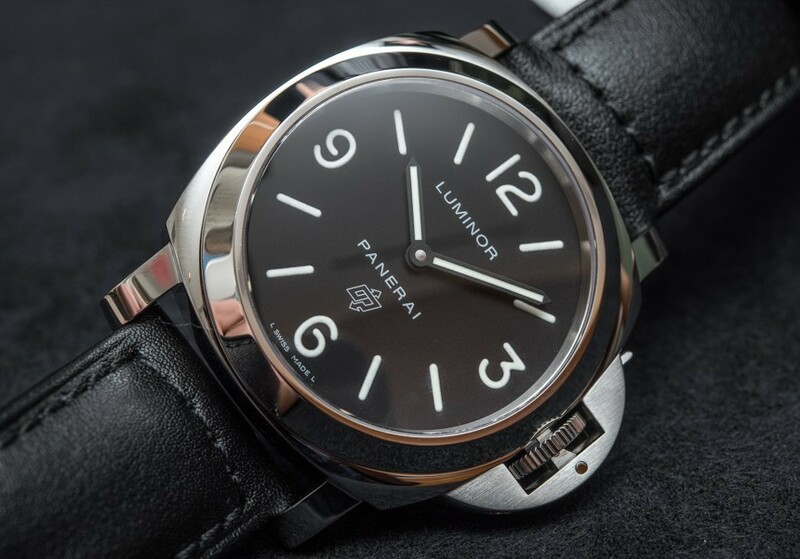 If you are just getting into the world of Panerai, you will have to note that the Panerai Luminor PAM000 Base Logo has a so-called “sausage dial” – a not very appetizing name for an otherwise cool aesthetic. 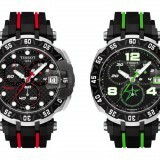 Notably, there are two main dial versions that the company offers, and they are differentiated by the way the luminescent material has been applied. The one here features a flat black dial with the Arabic numerals and baton hour markers painted on the surface, hence, the lume appears slightly domed or elevated from the plane of the dial. 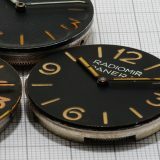 The other Panerai option is the sandwich dial, which is as straight forward as it sounds: there are two dial plates, the bottom one is solid and has lume applied to it, while the upper one has the hour markers cut-out, revealing the lume underneath. This method gives more depth to the dial, while the “sausage dial” of the Panerai Luminor PAM000 Base Logo is arguably a bit more historically authentic (if that’s your thing), and somewhat more simple looking, allowing for other design elements to stand out. The movement inside is the Panerai OP I, as bog standard as the name implies – but that’s not necessarily a bad thing. It is basically the trusted ETA 6497 hand-wound movement which, in this iteration, is something that Panerai has been using since 1997, the dawn of its renaissance. 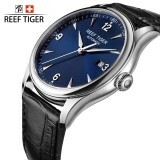 As a large, reliable, rugged caliber that was originally designed to be a pocket watch movement, it fills up the case nicely, and it runs at 3 Hertz with a power reserve of 56 hours. It is hidden under a solid steel case back that bears the Officine Panerai logos and designations, and also carries the case number and serial number. For that added sense of exclusivity, the Panerai Luminor PAM000 is limited to production runs of 2500, with each run being marked by a letter from the alphabet – so you have M series, N series, and so on. 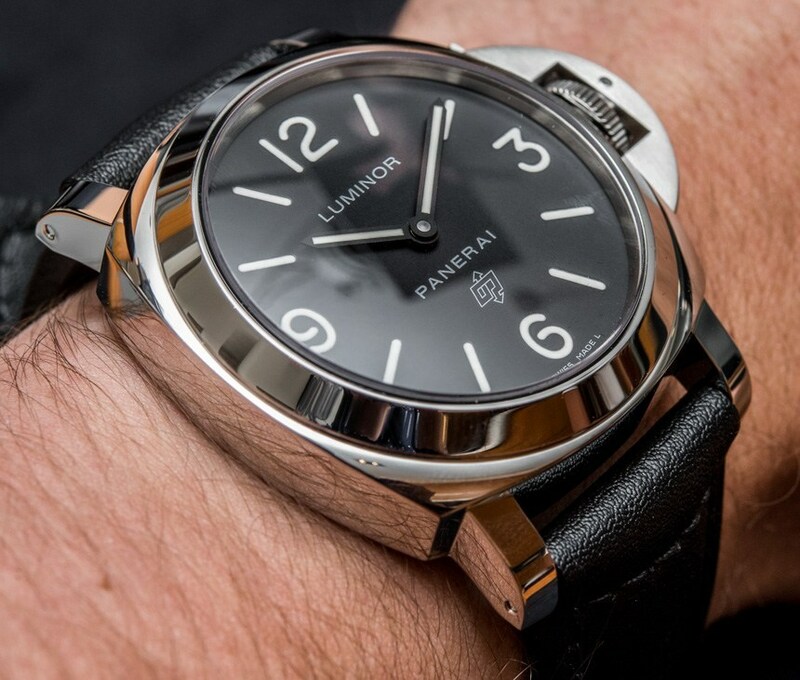 Okay, so by now we have discussed most of the technicalities of the Panerai Luminor PAM000, but that only partially helps us determine the answer to the original question – just how much of the Panerai experience it manages to deliver. 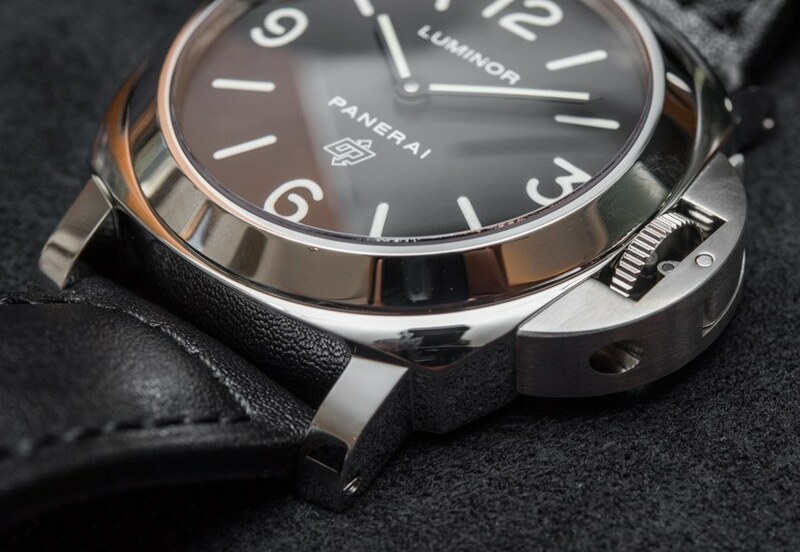 Well, as we can see, the Panerai Luminor PAM000 Base Logo is packed with design elements that are highly relevant to Panerai’s history, and both the case size and shape, as well as the crown guard and dial design work together in a way that they help you enjoy not one or two, but a large number of unique Panerai treats. While there is no one definitive reason why so many have become (nearly) addicted to this wearing experience, the way the Panerai Luminor case looks on the wrist certainly is one of them. And with this, we have arrived at an interesting point and one that you may not realize until you have either seen hundreds of Panerai watch images, or you yourself already own one: the remarkable versatility of the design. In 1997, Officine Panerai was acquired by the Richemont Group (then known as the Vendôme Group) and the entire military manufacturing branch of the business was closed. A year after, the first group of Panerai watches was introduced to the general public. Large, practical, army watches coupled with pure Italian layout sparked an overwhelmingly enthusiastic response spawning a fan club of die-hard Paneristi.American designer Ralph Lauren, with a large collection of Panerai vintage watches, place his finger on what makes this new so appealing to guys now: “The luxury of Panerai grew from its heritage and the purposefulness of each detail. Panerai watches weren’t about the newest style, they were developed to operate in particular conditions. Their form and beauty have been secondary to their function; they are rugged, functional and handsome. “The new strong association with the sea has taken a more recreational twist and, in 2006, Officine Panerai restored and bought Eilean, a 1936 Bermudan ketch sailing vessel built in Scotland. Three years of restoration ensued to bring her back to her original splendour and she competes in vintage yacht races around the world. The Panerai Classic Yachts Challenge, which started this year with the Antigua Classic Yacht Regatta and will culminate with the Cannes Regates Royales in September, has been going strong now for 10 decades and every edition of the race is celebrated with the launch of a Regatta watch. This season, the Panerai Luminor Submersible 1950 3 Days watch, was published in a limited edition of 50 pieces to commemorate the 10th anniversary of the race. With a lug width of 24 millimeters and a hassle-free strap changing system, the round dial and cushion shaped case of the Panerai Luminor can change its appearance entirely by the addition of a different strap – and worry not, there is a smaller industry worth of larger companies and one-man workshops around the world who have specialized in crafting fantastic straps. Using various kinds of leather and rubber, they have been granting the Paneristi (the fans and collectors of the brand) virtually endless options to change the looks of their watches. From a full-on military look through fun colorful options, to an elegant and restrained aesthetic, this simple combination of a curved case and round dial can be renewed over and over again in a way few other watches can be. 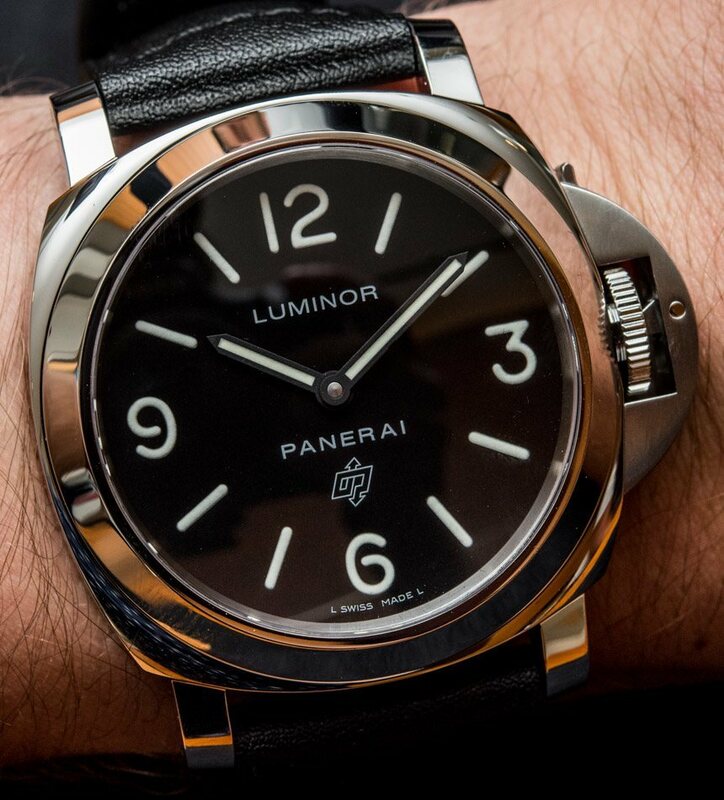 This ease of maintaining versatility is what many consider to be one of the key defining factors that made Panerai so popular – and because the Panerai Luminor PAM000 is as basic as they get (apart from the addition of the OP logo at 6), it will wear different kinds of straps beautifully. 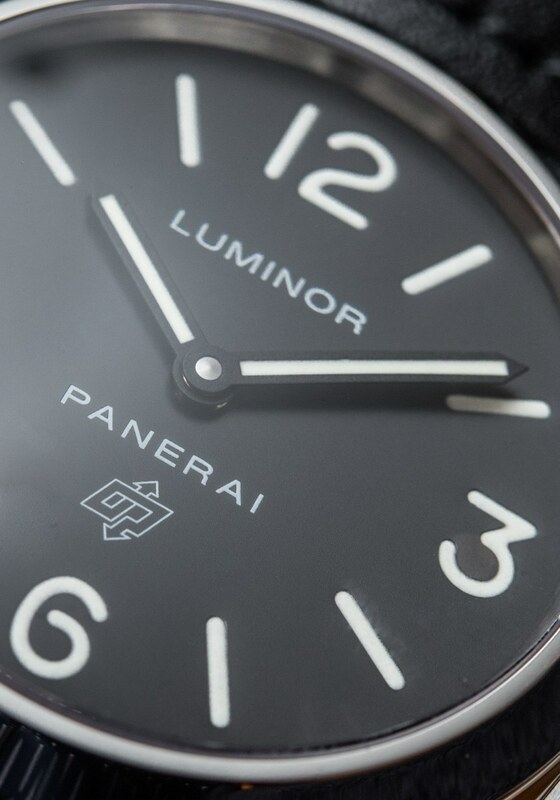 Speaking of the addition of the logo, we arrive at discussing the alternatives to the Panerai Luminor PAM000 Base Logo. Finding an alternative from another brand will be challenging because the Panerai wearing experience is so specific that it can hardly be replicated by getting something from another brand. 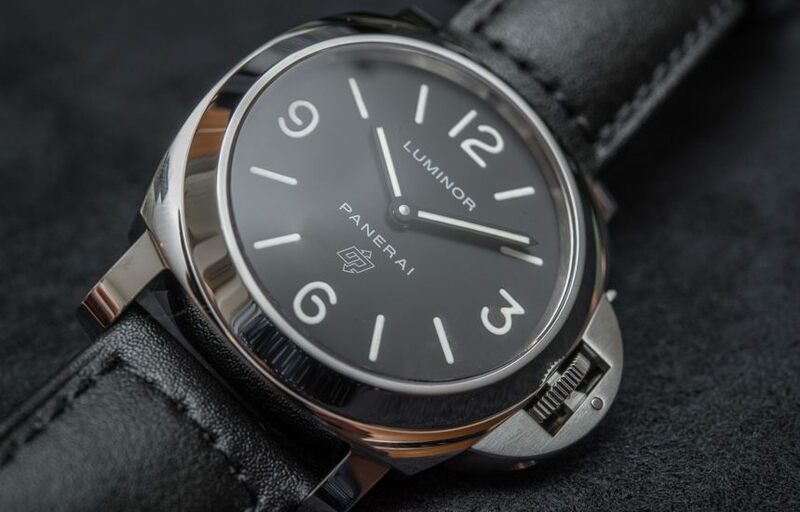 There are plenty of “Panerai homages” out there, but instead, we will look at two offerings – one more affordable and one priced higher than the Panerai Luminor PAM000 Base Logo – that in one way or another can be suggested as an alternative. We will, of course, look at some other options, but first, let’s stay within the realms of Panerai and look at the Panerai Luminor PAM112. At first glance, it looks remarkably similar – same case size, material, and color scheme – but, as always with Panerai, it all comes down to subtle differences. The PAM112 replaces the sausage dial of the Panerai Luminor PAM000 Base Logo with a sandwich version, loses the Base Logo from 6, and features the OP X movement which adds a swan neck regulator to the OP I and, more importantly, is on display thanks to a sapphire case back. The Panerai Luminor PAM112 is priced at $5,900, so you are paying quite a bit of a premium for those small upgrades. As we said just above, it is very difficult to replicate the Panerai experience, but you are not out of luck if your budget is a bit tighter. 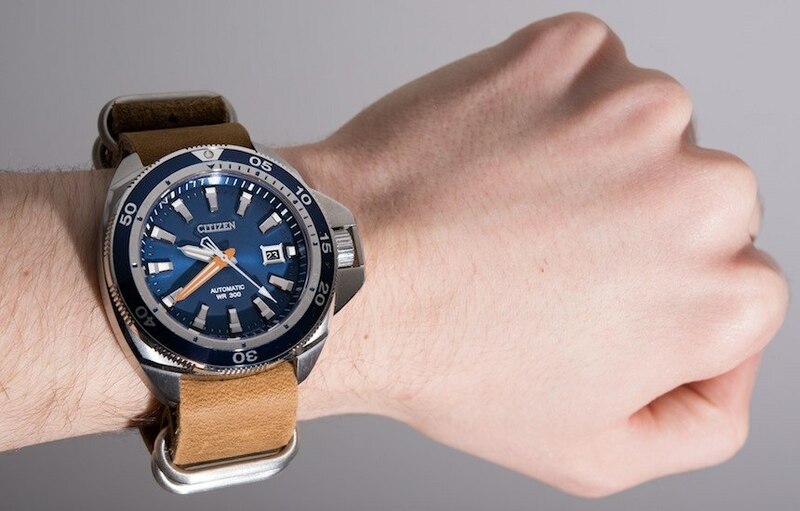 The Citizen Grand Touring Sport (hands-on here) is an excellent dive watch and one that I have been wearing on and off for a few months now. 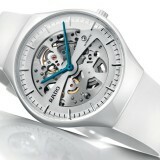 Interestingly, its stainless steel, cushion shaped case is also 44 millimeters wide (three major similarities right off the bat), it also features a crown protector – which although works in a slightly different way, it looks very similar – and it also comes with a mechanical movement, and a really good one at that, from Citizen. 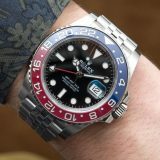 Priced at $1,195, you also truly get a nicely executed steel bracelet – but you can get away with putting it on leather straps, see the image further above. What you do miss, beyond the name and the Swiss Made designation on the dial, is of course that powerful, restrained elegance that comes from the minimalistic appearance of the Panerai Luminor. 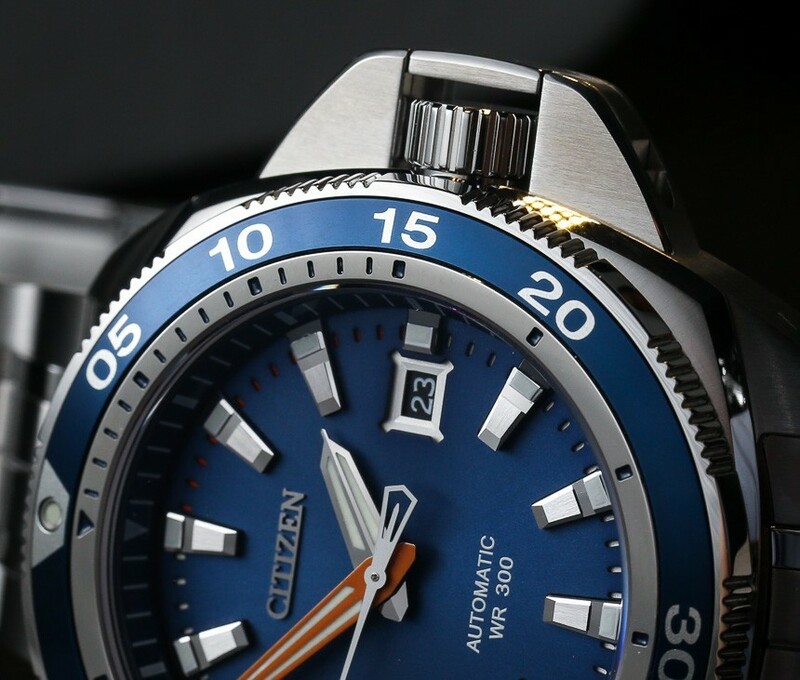 A diver’s bezel, date, and central running seconds all add to the complexity of Citizen’s design – which may or may not be a bad thing; that is entirely up to personal taste. 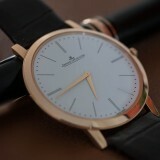 It is nevertheless an extremely well made watch with its own kind of masculine aesthetic. For the next alternative we picked, we looked for a vintage diver offering from a major brand to put up against the Panerai Luminor PAM000. A vintage inspired dive watch that, although in different ways, delivers on some of the key points that make the Panerai stand out. 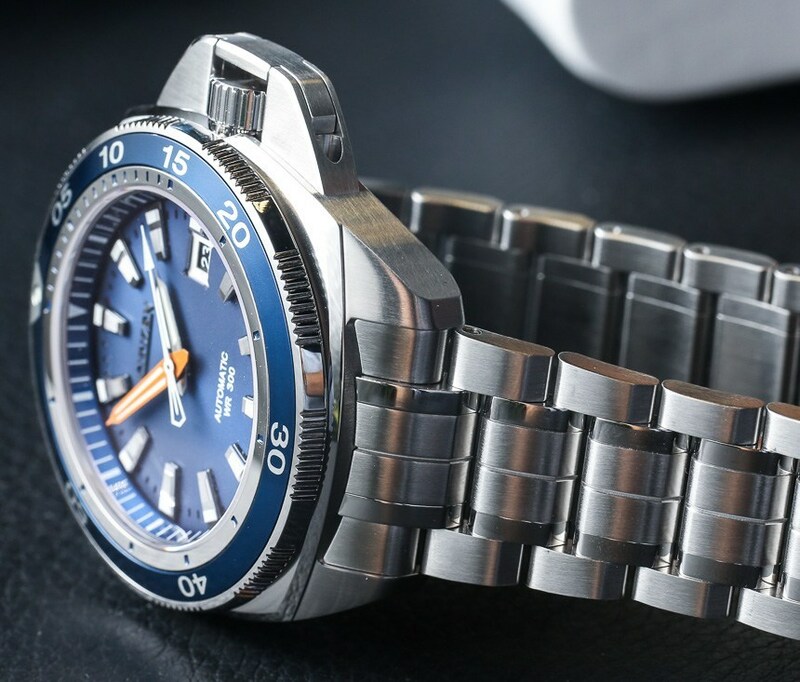 Its full-on dive watch design is relatively restrained but is versatile enough, and the wearing experience that it provides is also unique and specific enough for it to be comparable. 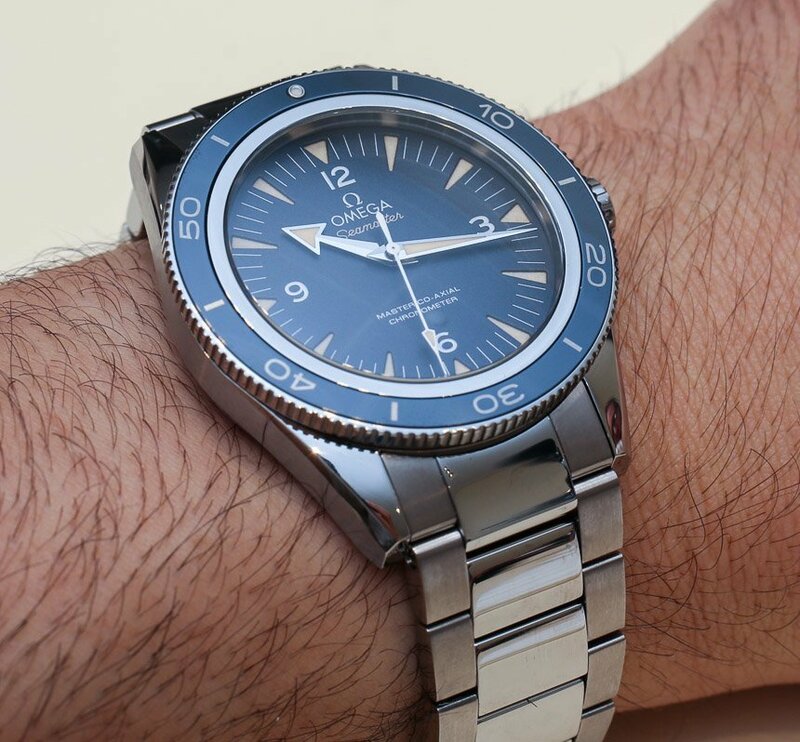 The Omega Seamaster 300 (hands-on here) debuted at BaselWorld 2014 and features Omega’s Master Co-Axial movement that is resistant to magnetic forces of up to 15,000 Gauss, a 41mm-wide case and a typically Omega “broad arrow” handset for the dial inspired by the original 1957 model. 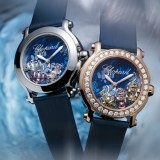 The looks are certainly different, but the “vibes” of wearing a vintage inspired, modern dive watch is similar. 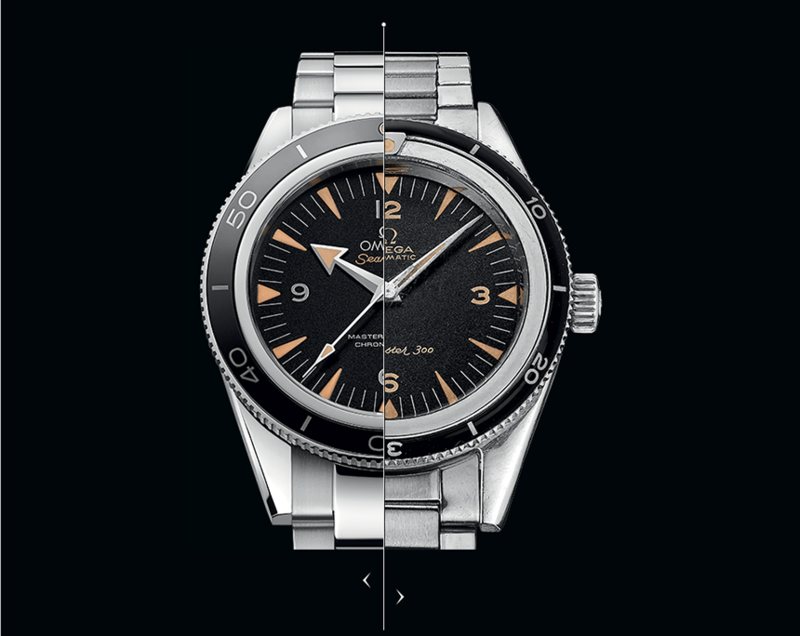 Price for the Omega Seamaster 300 in steel on the bracelet is $6,600. 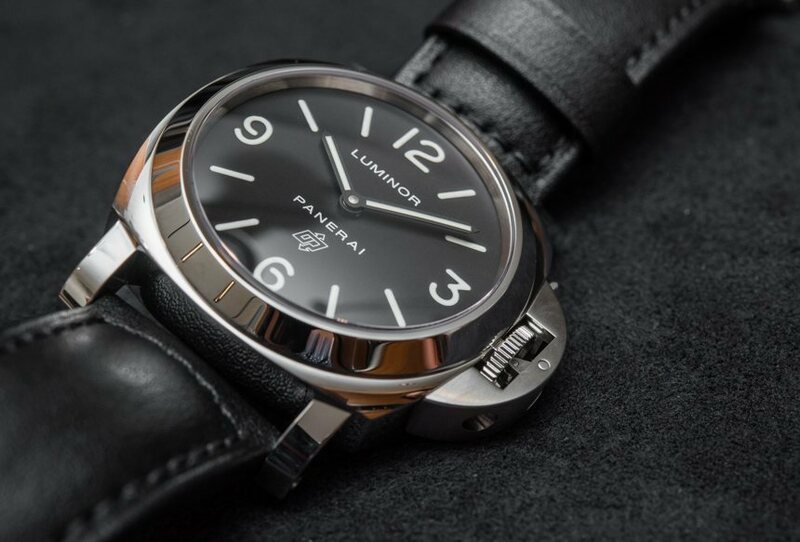 That is clearly more than the Panerai Luminor PAM000 Base Logo, but the pricing premium is justified by the modern, proprietary movement and the steel bracelet.